San Jose Sharks right winger Joonas Donskoi accidentally took out his teammate with a huge hit when Vegas Golden Knights forward Ryan Reaves sidestepped him during Saturday night's game at the SAP Center. It happened in the middle of the second period with the Golden Knights holding a 2-1 lead. 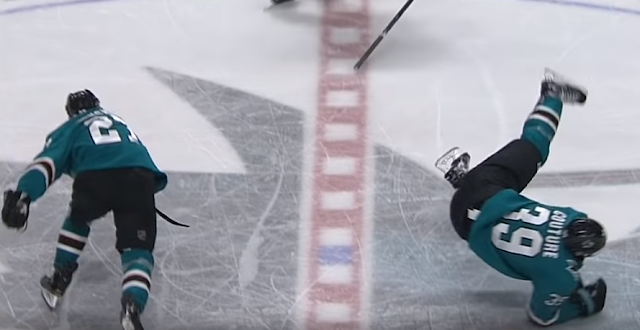 As Ryan Reaves was catching up to the puck at center ice, Donskoi was lining him up to crush him while Sharks center Logan Couture was looking to bump Reaves from behind. Reaves pulled off a fantastic sidestep move while maintaining control of the puck, catching Donskoi and Couture off guard and unable to avoid each other at the last minute. The end result was Donskoi knocking Couture off his feet and flat on the ice. Couture took a rest on the bench after the hit. However, not only did Couture continue playing, but he finished with two assists, including one on the game-winner in overtime as the Sharks beat the Golden Knights 4-3.